How many times have you given up trying to remove stubborn limy plaque from a bathroom mirror? When all standard means of cleaning don’t help! Your problem is now solved with a Migakuno firm sponge! 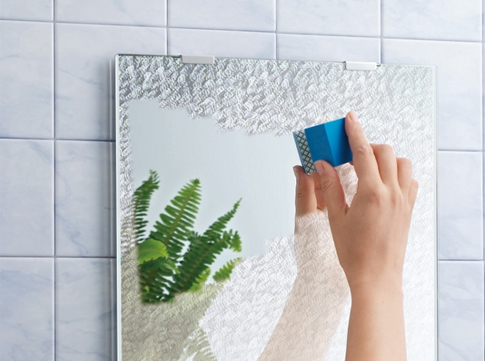 Easily removes limy plaque from ordinary mirrors in showers and bathrooms! Rub away lime and plaque with just water! Dirt disappears in a flash right before your eyes! Absolutely safe and economical for repeated use! – Safe for your health and the environment: doesn’t contain harmful substances. * Plastic and metal mirrors, fog free mirrors, fog free film mirrors, opaque and colored mirrors, automobile glasses, eyeglass lenses, water-repellent glass and other special mirrors and glass surfaces. 1. Firstly wash the mirror or glass with water removing all pollution and dust. 2. After rinsing with water press the sponge to the surface of the mirror. 3. Using light wipes, remove any limy plaque without using any pressure. 4. Wash away the cleared surface of the mirror with water again and wipe dry with fabric. 5. When finished wash out the sponge with clean water, wipe dry with fabric and, having dried, store until necessary. 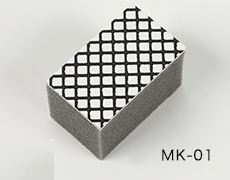 – The sponge is used only for cleaning of glass mirrors and transparent glass. – If the mirror surface is polluted, before cleaning it is recommended to wash it soap or neutral detergents. * Diamond dusting is a hard polishing material and it is possible to scratch a surface with bad use. It is recommended to test before cleaning using a trial subject. * Formed over a long period of time limy mirror plaque cannot be removed completely sometimes. * We also offer other special means of cleaning glass mirrors: such as liquid and spray. Calcium and magnesium, minerals in water, washing foams, gels, shampoos, soaps and other substances are the reason for deposits that appear on china, porcelain, enamel, ceramic tiles, which forms a plaque called lime scales, films and stains extremely resistant to removal. Bathroom fixtures, sinks, dishes, and other surfaces need more frequent cleaning. 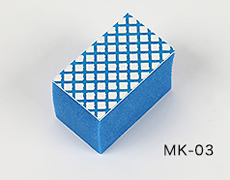 Your problem is now solved with a Migakuno soft sponge! 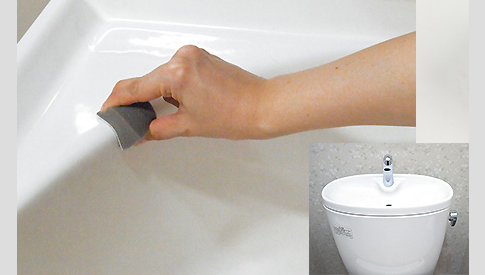 Easily removes limy plaque and stain from ceramic tiles in showers, bathrooms, toilets and kitchen! Rub away lime and plaque with just water and the sponge! Stain disappears in a flash right before your eyes! Ceramic bathroom and toilet equipment: bathtubs, toilets, sinks, ceramic tiles. * Plastic, acrylic bathroom equipment: wash basins, toilets, bathtubs that have had special treatment; artificial marble; tiles and ceramics with antibacterial, anti-fungoid processing; a tile with an opaque and rough surface, unglazed ceramics and other. 1. Firstly wash the ceramics or tiles with water removing all pollution and dust. 2. After rinsing with water press the sponge to the surface of the ceramic. 4. Wash away the cleared surface of the ceramic with water again. * If the cleaning layer of a sponge became dirty with fat or oil, wash it out with soap water. 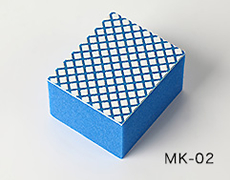 – The sponge is to be used only for cleaning of natural ceramics and ceramic tiles. * Diamond dusting is a hard polishing material and it is possible to scratch a surface with bad use. Test a small spot before using. * Formed over a long period of time limy ceramic plaque cannot be removed completely sometimes.